After months of hard work, I'm delighted to announce the launch of Funky Dory Party Bags' new sister site - www.personalisedparty.co.uk. As you'd expect from the title, Personalised Party specialises in personalised party products such as personalised party bags, wedding activity boxes, personalised chocolate bars and handmade bunting. The launch of Personalised Party sees the introduction of our brand new personalised recycled paper party bags. 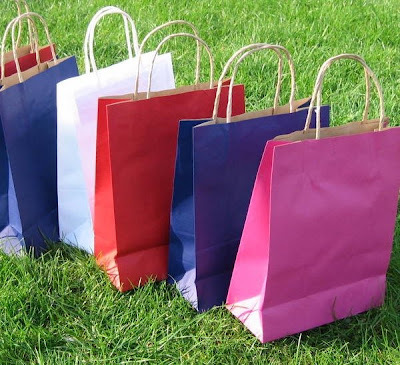 In an assortment of colours and themes, they are larger than a standard party bag, as well as luxurious and eco friendly. They make beautiful party bags and wedding activity bags. For the time being, you will still be able to buy personalised items at Funky Dory Party Bags, but it's well worth a visit to Personalised Party, because not only will you find a larger choice of personalised products, but also, for the whole of May we are offering a 10% discount on all orders to celebrate the launch of this new site. To claim your 10% discount, please enter code WEBLAUNCH. If you are also looking for something to put inside your personalised party bags or boxes, then don't worry, because you can also buy party bag fillers at Personalised Party. I've just taken delivery of some fab new pocket money toys that would make excellent fiddle toys for wedding activity boxes and parties, as well as party bag fillers. First up is the pocket-sized "tic tac toe". Play noughts and crosses with yourself or an opponent. This is really handy pocket money toy for car journeys as well as events where kids might need something to amuse them for a short while. We also have some love moody face keyrings. Flour filled rubbery faces that can be squeezed and pulled in all directions. A great fiddle toy for kids, and anybody with idle hands, really! 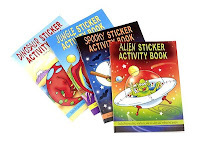 I'm always on the lookout for pocket-sized books and activities that can provide a bit of quiet stimulation for kids, so I'm really pleased to with our new sticker activity books. They are packed full of colouring pages, stickers, dot-to- dots, mazes, word searches and puzzles, so are perfect for wedding activity boxes and party bags. You can see these and all our other pocket money toys in our party bag filler section of Funky Dory Party Bags. I'm pleased to let you know we now have some gorgeous recycled kraft paper party bags in stock. Made from 100% recycled paper, with paper twist handles, they come in an assortment of bright colours including red, magenta and blue. Larger than the average party bag, they measure 20cm x 9cm x 25cm, so there is plenty of room for as many party bag fillers, toys, and cake as you wish! A good tip for young children is to give them a craft or art project to do. It doesn't have to be very complicated - just some colouring pages you can print from the internet, would do for toddlers and pre-schoolers. 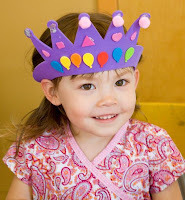 You can either introduce the craft activity at the beginning of the party while you're waiting for every one to arrive (you can supply some pre-cut party crowns or hats and get the kids to decorate their own, or provide a large piece of paper to decorate and use as a placemat for their birthday tea). Alternatively, if you have a room of excitable children, have them do the craft activity at the end of the party. In this way, they will calm down before being released into the community! 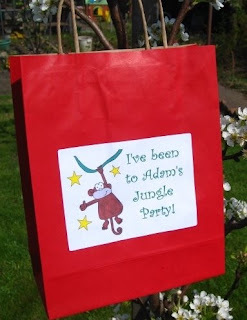 Possible craft ideas are animal masks, icing fairy cakes or biscuits, designing and decorating their own party bag. Sign up to our monthly newsletter and receive updates on all our new products, as well as lots of information and top party tips. We'll also send you exclusive offers for you and your family and friends, both from Funky Dory Party Bags and other websites that we think may be of interest to you. We promise not to spam you. The newsletter will be sent once a month at most, and you can unsubscribe at any time. Please either sign up at the top page of the blog, or at the funky dory party bags home page.